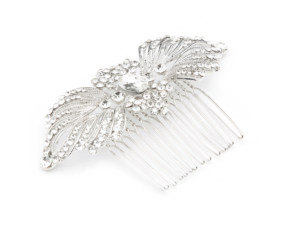 Art Deco style hair accessories are set to be big in bridal next year. Drawing influence from the roaring twenties, art deco accessories and jewellery epitomise decadence and glamour – materials are luxurious, designs are ornate, and colours are super sharp. For style reference, look no further than Baz Luhrmann’s remake of the iconic film The Great Gatsby. The Art Deco trend is heavily influenced by this year’s Royal Weddings. 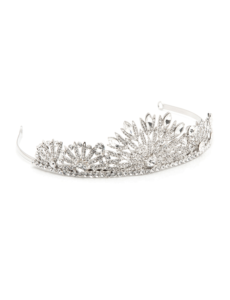 Meghan Markle’s bandeau wedding tiara bears all the hallmarks of the period – geometrical design, clean lines and delicate curves. Art deco was all about opulence and there’s nothing half-hearted about Meghan’s headpiece, made from solid platinum and encrusted with antique cut diamonds. Princess Eugenie’s wedding tiara also harks from the Art Deco period. Made by Boucheron in 1921, the tiara’s crescent shape and emerald stones are typical of the era’s jewellery. The good news is you don’t have to have the budget of a Royal bride to acquire a similar look. 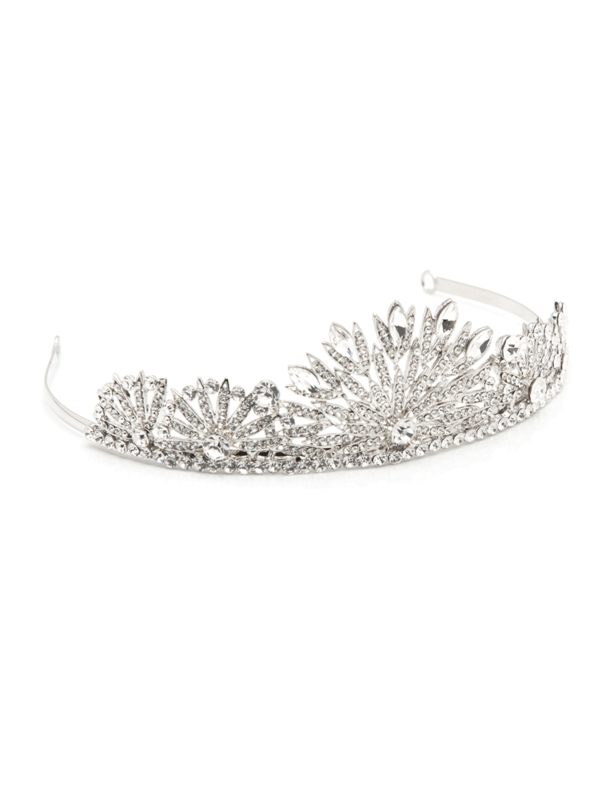 Our Harper tiara has vintage art deco appeal with characteristic curves and plenty of sparkle. Flapper girls often wore headbands across the crown or aross the front of the head. Our Freya Headband made up of geometric crystal clusters captures the art deco style perfectly. 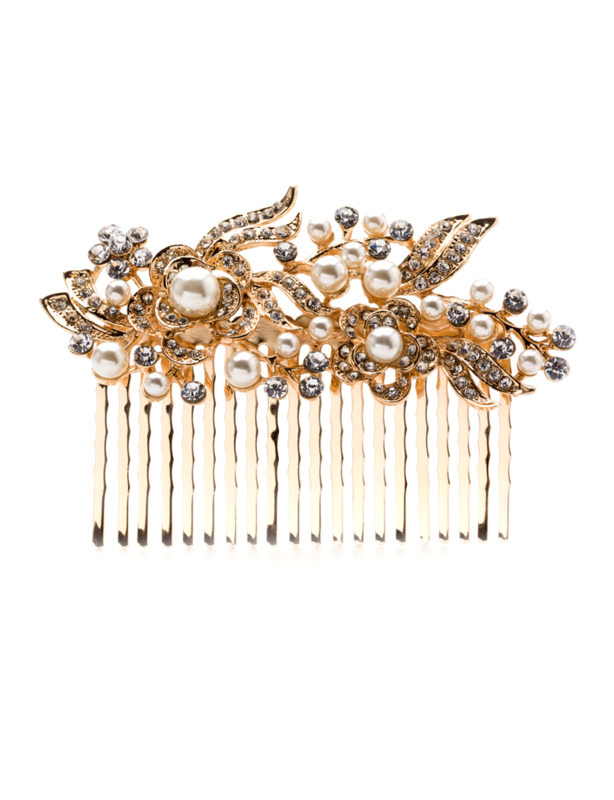 This simple yet stylish headband suits all kinds of wedding hairstyle, from glossy bobs to long soft finger waves. 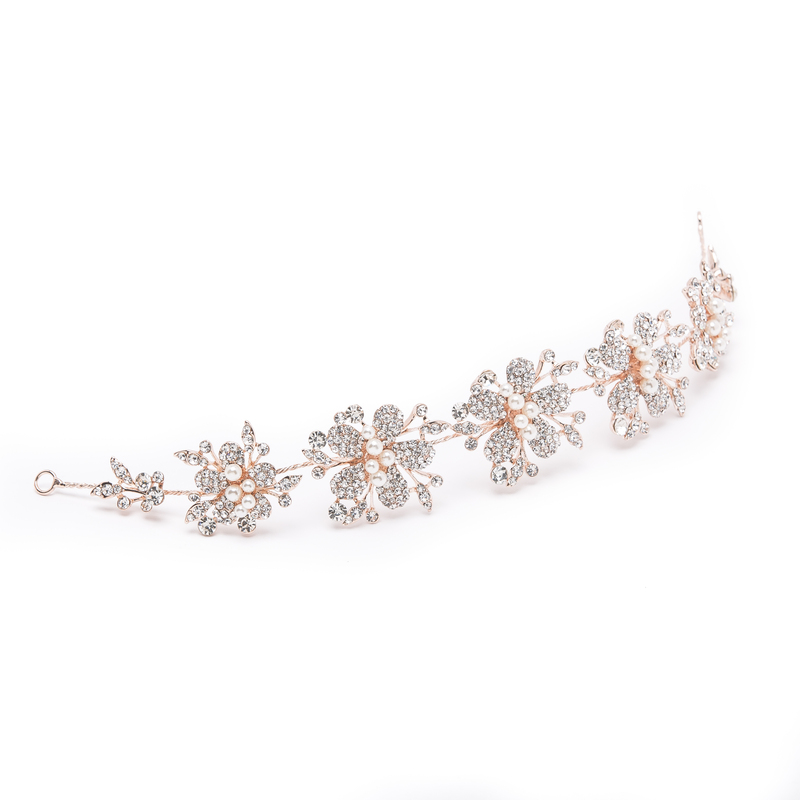 Our Innes Rose Gold Headband exudes vintage romance; its crystal and pearl floral design reminiscent of a much-loved piece handed down through generations. This headband is ideal if you’ve yet to decide on your hairstyle as its flexible frame can be manipulated in a variety of ways, allowing you to go with the flow on the day. For a modern take on the flapper headband try our stunning Fleur headpiece. 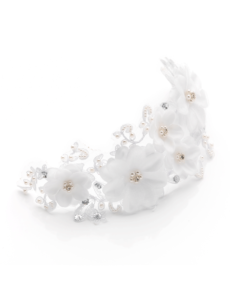 Made of white fabric flowers, crystals, pearls and delicate lace edging, this looks beautiful with up or down tresses. 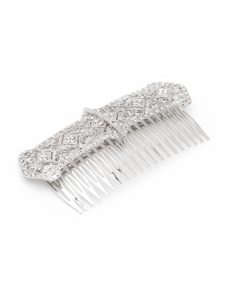 Weaving 1920s style into your wedding outfit is easy with our art deco inspired bridal hair combs. A hair comb is really freeing as you can accentuate your hair depending on how you feel on your wedding day. They can also be worn solo or with a veil. 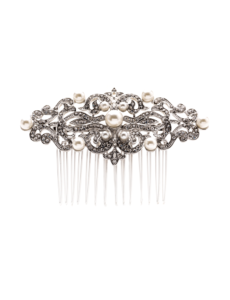 Our Adrianne vintage crystal and pearl hair comb has a real Gatsby vibe – the delicate scrollwork decorated with rhinestones and ivory pearls will enhance any hairdo to perfection. 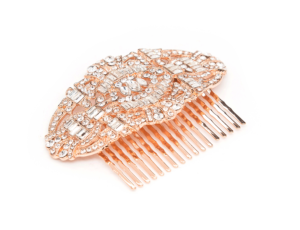 This warm gold Clarissa hair comb adds old school glamour to a range of wedding hairstyles – simply sweep along the side of the head and pin back hair for a loose romantic look or use to accentuate a bun or French twist. 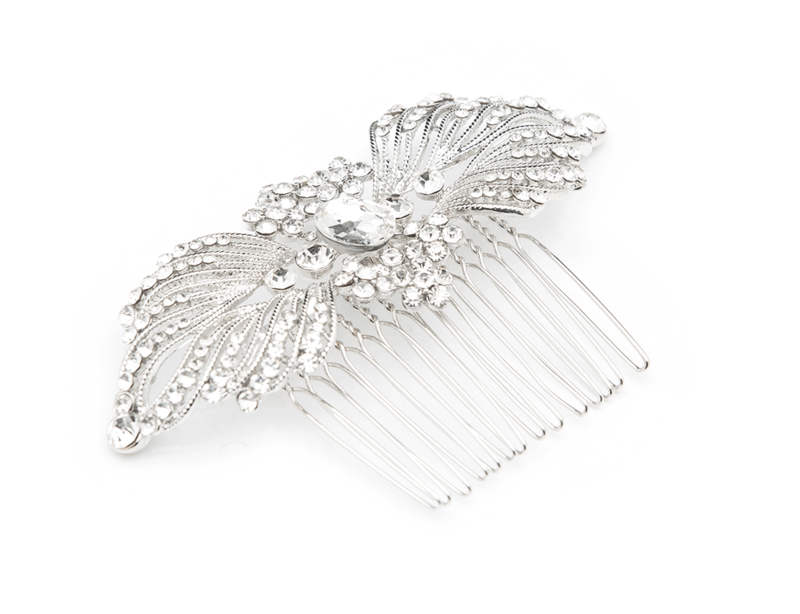 Our art deco style crystal encrusted Eden hair comb also makes a stunning accessory – tuck into the side of the hair for a sweep of sparkle or use to glamorise an elegant up-do. 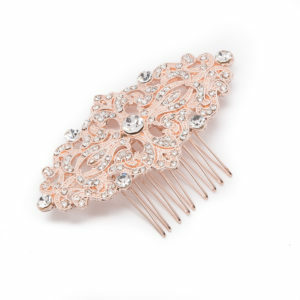 Rose gold accessories are hugely fashionable right now with many brides are opting for this luxurious accent colour. 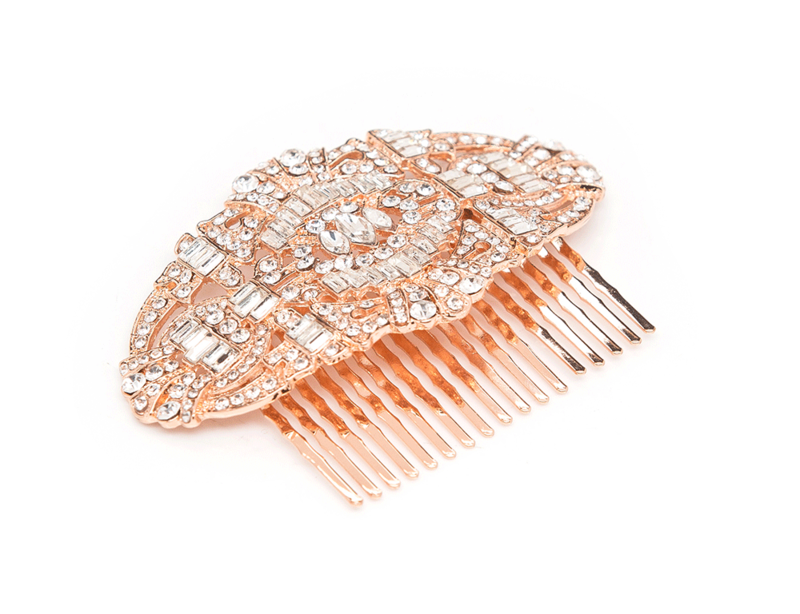 If this warm hue is for you, our popular Everly Art Deco hair comb featuring baguette crystals is totally on point. Side partings and soft waves were a trademark look of the 1920s and 30s, made popular by stars of the silver screen such as Jean Harlow and Gretta Garbo. 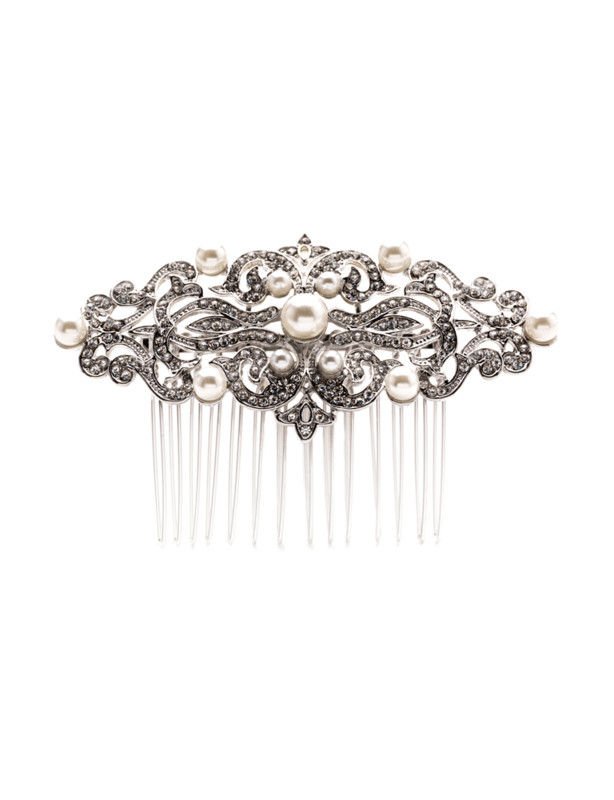 Channel your inner Hollywood siren with these glamorous hair combs. The Giselle silver hair comb embellished with big and small crystals and Valentina rose gold hair comb are perfect for securing one side of hair away from the face or adorning bridal buns. 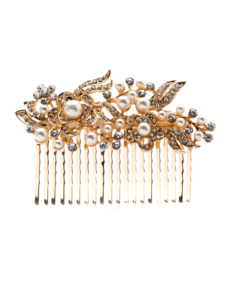 Love our award-winning bridal hair accessories?